Spending a week in the Adirondacks hiking, horseback riding and mountain climbing may sound more like a vacation than summer school, but for the past six summers, Sanford Geffner has led UB students out of the classroom and into the mountain wilderness for a week-long educational expedition. His winter excursion: a week-long exploration of the Florida Everglades that has students trudging through waist-deep cypress swamps, canoeing through mangroves and snorkeling around coral reefs. Geffner, an avid naturalist and instructor in the UB Environmental Studies Program in the College of Arts and Sciences, has been giving students an up-close look at nature for nearly 20 years in such courses as "Ethics of Survival," "Field Ecology" and "Ethnobotanical Surveys." 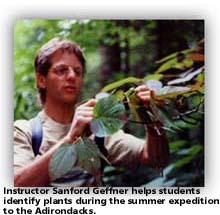 The summer trip to the Adirondacks, as well as the winter trek through the Everglades, are "The Ecology of Unique Environments" courses Geffner developed to give environmental-studies students the opportunity to study unique and threatened environments through challenging and intensive field study. "I do my best to give them a better sense for field studies and, ultimately, their role within the environment," says Geffner, who points out that his courses also help provide students with more viable career options. "There is a great need to enhance awareness for the way the world works. My goal is to make all of these students naturalists, regardless of which aspect of the environment they pursue." Geffner emphasizes how valuable field experience is to a student pursuing a career in the environmental field. He says he has received letters from former students now working in the field who are grateful for their experience and the opportunities made available to them in his courses. The courses, which are closed to non-majors, require students to keep detailed field journals in which they list and illustrate 100 of the plant and animal sightings observed during the field study. 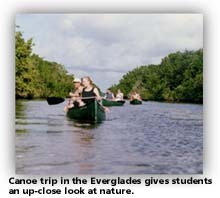 On a typical trip to the Everglades, Geffner says they identify some 240 plant and animal species. 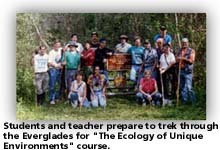 "When students complete this course, they often know the Everglades better than the park rangers. In fact, the rangers often request to join us on our field excursions in order to enhance their own appreciation of the park." What makes these environments "unique" is how history and politics have impacted upon the ecology of these particular regions, explains Geffner. His approach is to expose students to this ecology of the environment and teach them how that integrates with the history and political situation surrounding the area and its eco-systems. "The uniqueness of the Adirondacks revolves around the fact that you have the largest state park in the country-6 million acres-and it is both private and public lands, which makes for interesting dynamics." Geffner admits that part of his interest in studying the Adirondacks and the Everglades comes from a personal fascination with these areas. "The Everglades are sub-tropical, so it is completely alien to what we are familiar with. The systems are different. Life is different. It is a very different world and an exciting one at that." Geffner also notes that part of the intrigue of the Everglades is that all of the eco-systems have been disrupted due to farming and urbanization, resulting in a concerted effort in the past 10 years to rebuild the area. "Students are awestruck and amazed," reveals Geffner. "Everything is so new to them and it is quite intense, since they learn an incredible amount in a short week." This past winter, for the first time since the course has been offered, Geffner and his students were lucky enough to spot the extremely rare and secretive American crocodile, which Geffner has been seeking for the past six years. Other highly endangered species Geffner and students have identified on their Everglades ventures are the Everglades kite, bald eagle, woodstork and manatee. Surrounded by the potential dangers of alligators and poisonous snakes, the students are trained to proceed cautiously and are accompanied by a certified emergency medical technician. Another one of Geffner's courses, "Ethics of Survival," explores the impact of religion and modern science on perceptions of nature, as well as survival skills that are developed during a "survival expedition" to Letchworth State Park. On this weekend trip, students must use their creativity and endurance to build a functional lodge and make their own meals using such foods as wild mushrooms, leeks and nuts that they collect. "The students soon learn that the more you know, the less you have to do to survive, and the more you can simply enjoy and learn," says Geffner. Geffner, who built his own log-cabin residence in the Colden Hills, never strays far from nature. In addition to his work at UB, Geffner and his business partner, Herb Burgasser, associate professor in UB's Educational Opportunity Center, run the non-profit organization Earth Spirit, Inc., which offers nature-education programs to schools, community groups and the public. According to Geffner, UB's Environmental Studies Program has grown dramatically as a result of shifting priorities in our society and heightened awareness among today's college students. In response to environmental crises, he adds, students have become increasingly concerned with preserving and appreciating the environment. The instructor, whose focus in environmental work evolved through a series of internships, says his experiences led him to the discovery that he could make a living teaching in and about nature. "There are many ways to effect changes," he says. "My way is through education."